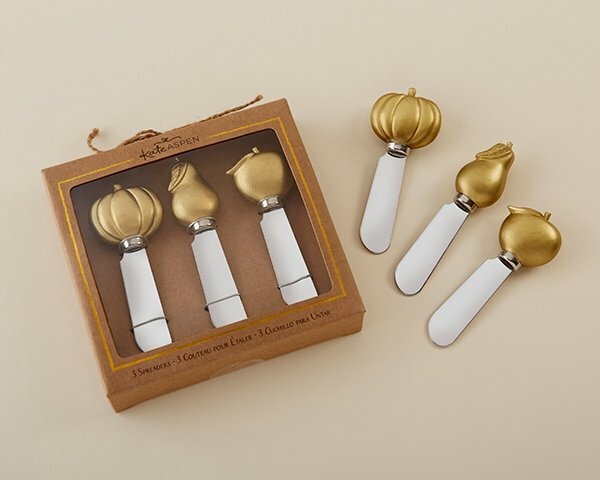 Bring a touch of seasonal style to your autumn table with Kate Aspen's Fall Spreaders Gift Set of 3! The fall themed spreaders feature an apple, a pear, and a pumpkin design to bring a seasonal touch to your dips, spreads, and cheeses. Packaged in an open face box along with an optional foil tag, the fall spreaders come ready for gifting! 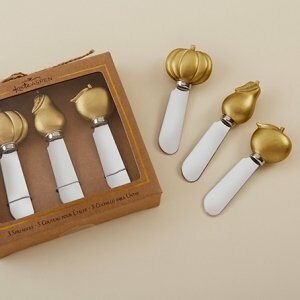 Silver metal spreaders with 3D resin apple, pear, and pumpkin shapes on top. Closeout Item. Minimum of 4 sets required for purchase.